A 17th century viola da gamba was badly damaged on an Alitalia flight from Rio de Janeiro in Brazil to Tel Aviv, Israel, but it is not clear why the instrument was placed in the baggage compartment of the airplane. The instrument, which is also known as a viol and is played upright similar to a cello, belongs to Myrna Herzog, the director of the Israeli classical music group Phoenix. She says she was forced by the airline to check the instrument when she was unable to obtain a separate seat to transport it in the cabin because the flight was full. Fox News reports that Herzog said the airline assured her that it would be treated as a fragile item and handled with care. 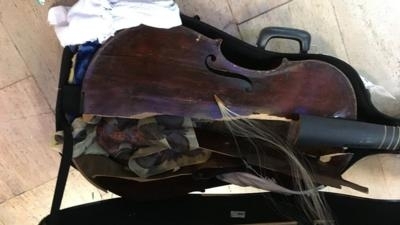 When she arrived in Tel Aviv, the hard case for the viol was crushed, and the instrument was broken in half. Herzog said even the airline employees who showed her the instrument were "horrified". The case was clearly marked "Fragile" and had been checked without several components for its safety. Herzog posted photos of the damaged instrument on Facebook and other social media sites. While some musicians heaped shame on the airline for damaging the $200,000 instrument, others have chastised Herzog for not purchasing a separate seat. The airline said in a statement that it "regretted" what had happened to the viol, Herzog had been advised to purchase a separate seat for the instrument, but she had refused to do so. Herzog disputes those claims. Herzog told the music blog The Strad that a restorer has said the instrument can be repaired, but that it may take as long as a year, and no price estimate for the repair has been given.